Discord erupts when jazz guitarist Gerry Martin plummets to his death from the rocks above the Jewel River. The one-time international sensation had fallen out of sync with festival organizers, students, and performers. Was his death an accident--or did someone even the score? 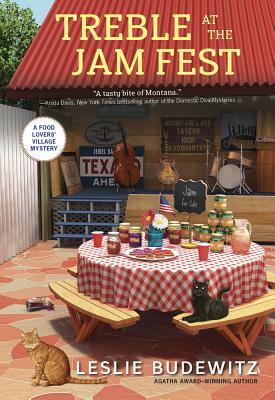 Leslie Budewitz is passionate about food, great mysteries, and her native Montana, the setting for her national-bestselling Food Lovers Village Mysteries. The first, Death al Dente, won the 2013 Agatha Award for Best First Novel. She also writes the Spice Shop Mysteries, set in Seattle's Pike Place Market. A practicing lawyer, Leslie is the first author to win Agatha Awards for both fiction and nonfiction. A past president of Sisters in Crime, Leslie loves to cook, eat, hike, travel, garden, and paint--not necessarily in that order. She lives with her husband, Don Beans, a doctor of natural medicine and musician, and their cat, an avid bird-watcher. Visit her online at www.LeslieBudewitz.com, where you can find maps of the village and surrounding area, recipes, and more.